The objective of CPC 3000 is to teach students the skills necessary to Charter a power driven vessel up to 50 ft in length and to be able to safely conduct all operations on a 5 day live-a-board voyage in US coastal waters. This course is specifically designed for serious boaters who want to increase their voyage planning skills along with their knowledge of vessel systems. 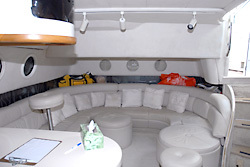 Class size on board is limited to 6 students to maximize individual attention and instruction while underway. Two professional instructors will be onboard for both deck operation and engine/system operations. 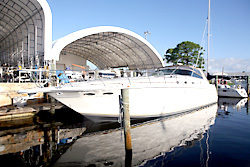 Students will plan and run a 5 day live-aboard coastal voyage on a vessel up to 50' in length. Students will lay out the navigation plan, secure the vessel, check all safety items and systems, review weather information and research marinas for each day. Students will be broken up into two groups sharing equal time while underway and during training sessions. Two full time instructors will be onboard working with students throughout the 5 day underway voyage. Seamanship: Familiarization with equipment recommended for offshore voyages, and safety. 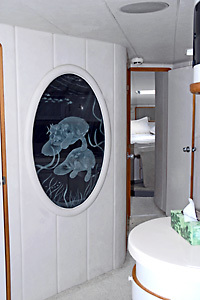 Knowledge and recommended treatment of seasickness and hypothermia. The selection and correct use of pyrotechnic devices for distress signaling. Strategies for heavy weather boat handling and for survival at sea including abandoning ship and life raft operations/procedures, abandon ship drills and MOB recovery drills. Procedures for navigating at night and during periods of restricted visibility. Trouble shooting and handling underway emergencies including engine, steering, and electrical failures and loss of electronics/navigation equipment. Coastal Navigation: Predicting tides and currents using appropriate tables, route planning including the use of waypoints. Navigating in both day and night conditions. Use of charts in conjunction with electronic equipment as well as use of publications including planning and enroute guides. Maintaining a proper navigation log. 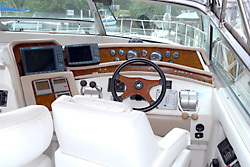 Advanced electronics including integrated GPS, Chart Plotter, and communications. Systems: Understanding and use of all onboard systems underway and at anchor. Use of Galley Equipment and cooking safety underway and at anchor. Advanced system troubleshooting and maintenance including: Diesel engine bleed down, Pumps, Changing impellers, filters and strainers, AC/DC systems, Generator operations, Fuel systems, Steering systems, Hydraulic systems, Freshwater systems, Auto helm, Synchronizers. Rules of the Road: Knowledge and recognition of navigation lights and day shapes, understanding and applying vessel chain of command and watch standing procedures. Voyage Planning: Conduct a thorough pre-departure vessel check including voyage critical systems and through hulls, mandatory and recommended safety equipment, and proper operations of propulsion and steering equipment. Fuel planning – range and refueling availability. Food and water planning and management including contingencies for emergencies. Overnight Considerations: Correct procedure for anchoring safely and securely including calculating proper scope. Procedure for setting up anchor watch and using bearings to check vessel position. Wednesday night at Marriott in Coconut Grove, Miami. Each student will pay for their share of the room cost upon checkout. Chapman School is not responsible for the cost of lodging. Average cost of lodging along the route can vary depending on seasonal rates and the route followed. The average cost per person plus tax is approximately $65.00 per night, double occupancy. Vessel Management / Helmsmanship: Maneuvering vessel safely in close quarters–docking and undocking. Use of the ship's compass and electronic equipment to keep vessel on course. Correct application of Rules of the Road. Use of correct boat handling techniques / procedures to transit inlets. Maneuvering the vessel using the correct methods for heavy weather and conducting MOB recovery using two different methods in day and night conditions. Persons attending the 5 day program must be at least 18 years of age and in good health, submit a properly completed and signed Registration Form and have an official ID on the first day of class. Successful completion of CPC 1000 & 2000 is required. This program requires a minimum number of five (5) students. Tuition is $4,500.00 per person (non-refundable). Tuition is due with the Registration Form 30 days in advance of the start of class. On receipt of your payment we will send you acceptance along with course study materials and intinerary. We recommend that you do not purchase non-refundable transportation until we confirm the required minimum of five students has been met. Tuition includes 3 nights of dockage, fuel, Instructor fess (two instructors), training materials, partial meal plan, navigation equipment, charts and certification. Tuition does not include lodging costs on the Monday, Tuesday, and Wednesday nights of the program..
Chapman School of Seamanship will make lodging reservation for Monday night at Sailfish Marina in Palm Beach, Tuesday night at Bahia Mar in Ft. Lauderdale and Wednesday night at Marriott in Coconut Grove, Miami Florida, double occupancy. Each student will pay for their share of the room upon checking out. Chapman School is not responsible for the cost of lodging. Average cost of lodging along the route can vary depending on seasonal rates. The average cost per- person plus tax will be about $65.00 per night; double occupancy. 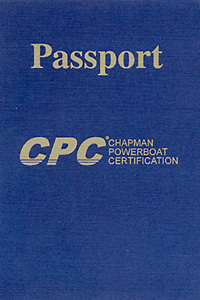 All students who successfully complete the CPC 3000 program will be awarded a "Certificate of Completion” from the Chapman School of Seamanship along with the CPC 3000 passport decal.